A sweet and spicy orange salsa packed with fresh herbs. I came across the idea of a salsa naranja, an orange salsa, on Kogi BBQ a while ago and it sounded really good! More recently I came across a recipe for the salsa naranja on Chow while searching for something else and decided that I would have to try it! In addition to the Mexican influences this salsa also has Korean and Thai aspects that really make it shine! 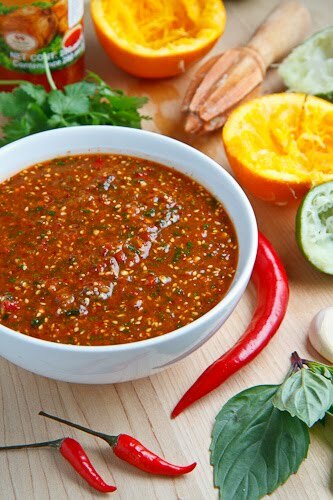 The salsa naranja starts out with a base of sweet chili sauce and orange juice and builds up the flavour base with garlic, ginger, plenty of fresh herbs, chilies is several different forms and it is finishes off with sesame seeds. Don’t let the long list of ingredients fool you as once you have them all assembled all you need to do is puree them in a food processor and it is well worth making. I have to say that this is one amazing salsa! It is sweet and spicy, full of flavour and all of the herbs give it a fatastic freshness that will have you eating it by the spoonful. Okay…this is like my fifth time trying to get the word verification thing typed out. If this doesn't work I give up! What I've been trying to say that I like the idea of this salsa!! KEVIN, THIS ORANGE SALSA LOOKS SO GOOD, BUT I HAVEN'T A CLUE AS TO WHAT "GOCHUGARU' and "GOCHUJANG" IS OR WHERE IN THE WORLD TO LOOK FOR IT. DO YOU KNOW OF A SUBSTiTUTE ? yum! so many ingredients that i love, this is a must try! Looks great! Love the color of the salsa. Nan: Gochugaru is Korean chili pepper flakes and gochujang is Korean chili pepper paste and you should be able to find them at a local Korean or Asian market and I have seen them in some larger grocery stores. You can also order them online at Amazon or other places. How long do you think this will keep in the fridge? I want to make a big vat of it! So delicious!!! Anonymous: Given all of the fresh components and lack of cooking I am going to say not too long; probably about a week. It will keep in the freezer though if you want to save some for later. Hey Kevin, I couldn't find the gochugaru, but I'm not sure it mattered because this salsa was fantastic! It's like a more complex dipping sauce for Vietnamese fried spring rolls. Spicy, sweet, tangy. Thanks so much for sharing! Kevin, I just made this!! This is super delicious. With the cold weather here in T.O. I'm using this as a dipping sauce for my hotpot!! Thanks for sharing!! Tigger mum: I am glad that you enjoyed it! I could eat it by the spoonful! Okay, so I made a variation of this for a family reunion (couldn't find a few things so I had to substitute) and it was a huge hit! Seriously Kevin, this stuff is ridiculously tasty! Great recipe!